The Organisation for Economic Cooperation & Development has forecast Germany and three other EU countries will again break eurozone deficit rules next year. Germany, Europe's largest economy, will break the rules for the fourth year running with a deficit of 3.2% of GDP. Worse still will be France with 3.5%. Italy and Portugal will also breach the 3% maximum rule. Germany is set to grow 1.2% next year down from 1.4% in earlier predictions. The OECD figures, reported in Monday's Financial Times Deutschland, also included lower growth forecasts for the euro zone as a whole but did not give a figure. Italy's deficit is predicted to be 4.3% of GDP and Portugal's 3.2%. Under the rules of the European Union's Stability Pact, euro zone countries are not supposed to run budget deficits above 3% of GDP. 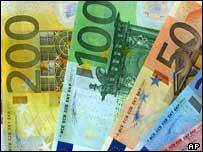 The European Commission wants Germany to cut its deficit by 0.8% this year and bring it down to 3% by 2005. These figures would suggest this will not be attainable. Germany says that with the economy growing at its current rate it needs more time to comply. In reports over the weekend, German Chancellor Gerhard Schroeder said the government target of 1.5% to 2% growth is within reach. EU Economic and Monetary Affairs Commissioner Pedro Solbes has in the past said the public finances of these countries are not in a good shape. Earlier this month he said France and Italy risked breaking the deficit rules next year while Germany seemed to be heading for compliance. Both German and French governments insist that boosting economic growth should take precedence over cutting their respective deficits. The EU's Growth and Stability Pact was put together in a bid to protect the credibility of the euro currency, used by 12 of the 15 members. Both Germany and France, the two largest euro zone economies, have exceeded limits and have been granted temporary suspensions of fines.